I like to think of myself as a bit of a green-fingered goddess. In my rich internal life, I am cultivating new varieties of orchid left, right and centre. In reality (isn't it boring sometimes? 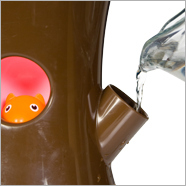 ), I am slightly scatty when it comes to remembering to water. I am, however, excellent on the Latin names of plants, but that doesn't really help keep them alive, does it? 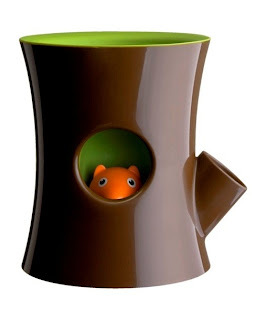 What I need is this marvellous Log & Squirrel self-watering plant pot by Qualy, £19.99 from Firebox. IT'S TIME FOR AN ANIMATED GIF! Hurrah! Look at him go. BOING! BOING! BOING! 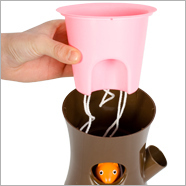 Qualy Log & Squirrel plant pots are available in brown and green or brown and pink. The green is out of stock on Firebox (SADFACE), but they are taking pre-orders for its imminent arrival in two or three weeks (HAPPYFACE). And the pink one, we can all buy now. 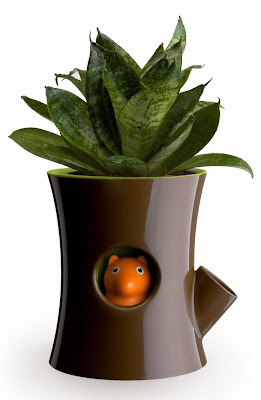 As the blurb on Firebox so rightly points out, this is "a brilliant gift for plant-lovers with a penchant for whimsical bushy-tailed critters". We all know one of those. Me, I'm just buying it for myself. 'Tis the season to be selfish.